Minimalism at its easiest (and most affordable). J.Crew&apos;s Camden sandals are easily among the best purchases I made this summer. Simple, easy to wear and in tune with 2013-2014&apos;s love of minimalism (and my 2013-2014 love of white and navy), they&apos;ve been everywhere from work to the beach to press dinners almost every day, and they look about as good as the day I bought them. As much as I favor navy, it&apos;s not every day that I want to wear a sandal of that hue, particularly if the rest of my outfit is all-white, all-black or a mix of grays. 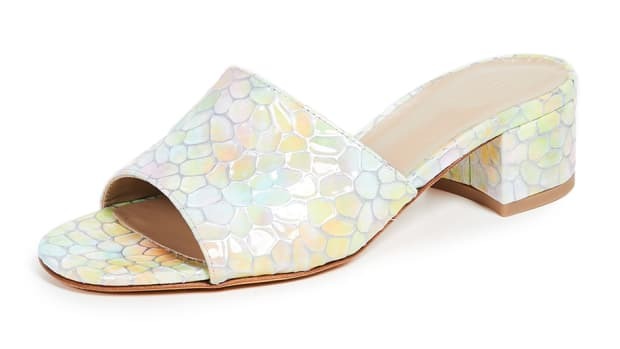 And so, in my quest to find a light-color alternative to the Camden (which only comes in navy and a coppery tan), I settled on these excellently priced white leather slides from Asos. At first, I was a little nervous the slides (and slides in general) wouldn&apos;t stay on my feet through my multi-mile walks across Manhattan, but I haven&apos;t had any trouble with that so far. Asos federal leather slides, $38.11, available at Asos.